Well, this week has been a week of lessons. Last time the images of Polaris and its companions was discussed. There was learning involved there in how to capture the images, but the real lesson is in not assuming you know what you see, because it just might not be so. Oops, I assumed the image of the star far to the left of Polaris was Polaris B and now it doesn't seem to be so. Once I actually calculated the arc distance between Polaris A and Polaris B, the true situation was revealed. The stars are really much to close together to be the star I assumed and picked. based on faulty understanding of what Photoshop was displaying when the "show pixels" button was selected. It turns out the pixel display was displaying the image as if it were 1000 pixels by 667 pixels rather than the real pixel size of my camera, which is 5184 x 3456. Once this correction factor was applied the measured distance was recomputed to be 16 arc seconds. This means that the close in star, which previously was though to be Polaris Aa, is not that at but instead Polaris B, which is listed as being about 18 arc seconds from Polaris A. Now at the end of this year, lets recollect a little bit of observatory history. Palmia Observatory was started on June 5 with the acquisition of the 8 inch scope. This scope turned me from just an armchair cosmologist to a real observing astronomer as well as a cosmologist. The observatory groups include the patio, the front porch, the parking lot, and the favorite location the tennis courts. 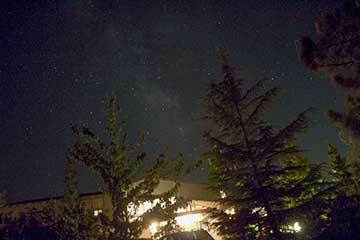 Other observing has been done at Anza, Blackstar canyon, Julian, Owens Valley and the OC Heritage Museum. The astro photos below show some of the equipment and staff. The newest addition of observatory equipment includes a brand new Coronado solar telescope with a goto polar aligned tripod mount. See below. As soon as I finish reading the manuals ( yes, it's a little embarrassing to announce that I am reading the manuals) we will have our first look at the sun's hydrogen alpha spectrum through that scope. The other resident astronomer, Peggy, and astronomers' assistant, Danny, complete the observatory staff, and are eager to begin the new year of observing.